In large bowl, beat cream cheese and softened butter with electric mixer on medium speed about 1 minute or until well blended; scrape side of bowl. Beat in egg and vanilla until smooth. On low speed, beat in cake mix until blended. Beat in 1/4 cup sprinkles. Cover and refrigerate 30 minutes. Bake 12 to 14 minutes or until edges are light golden brown. Cool on cookie sheet 2 minutes; remove from cookie sheet to cooling rack. Cool completely, about 20 minutes. 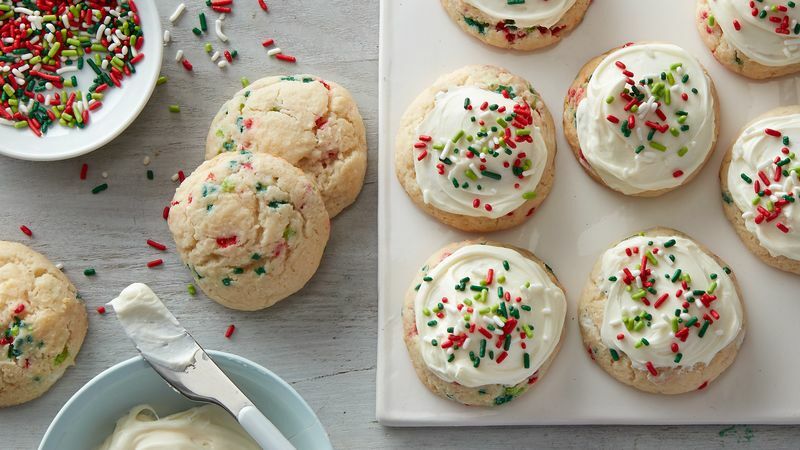 Using knife, spread slightly less than 1 tablespoon frosting over top of cookie, and immediately top with sprinkles. Repeat with remaining cookies. Store in airtight container at room temperature. Sprinkles can be customized for holidays or different events — use your imagination!